After reading Bill Berkson’s letter to you, in conjunction with Tony Towle’s letters, it seems clear to me that my attribution of “Finding Leroi a Lawyer” to O’Hara has provoked strong, skeptical reactions from some people who were very close to O’Hara himself, who know his work better than anyone, and whose judgment I respect enormously. I am certainly not inclined to insist on an addition to the O’Hara canon which has raised such doubts from close associates of O’Hara himself. Just to explain the context: in the course of my archival research for a book about friendship and postwar American poetry, especially in the work of O’Hara, Ashbery, and Baraka, I came across a document that was in Kenneth Koch’s possession, that he gave to the Berg Collection at the New York Public Library, in a folder of O’Hara materials (filled with letters and poems from O’Hara himself, and other miscellaneous O’Hara-iana). Although it was not signed by O’Hara, there seemed, to me, a good deal of internal and external evidence it was by O’Hara himself and simply no indication it was written by anyone else (I’ve explained some of my reasoning in previous posts on Isola di Rifiuti). My decision to attribute the poem to O’Hara was made in good faith and based on what I believed to be valid reasoning. However, after hearing these responses from Towle and Berkson, I recognize now that I may have been too quick to make the assumption that it was by O’Hara. I still can’t help wondering, though, if the poem is not by O’Hara, then who did write it and how it ended up in Koch’s O’Hara materials. Thanks to all for the very interesting discussion. My eyes are vague blue, like the sky, and change all the time; they are indiscriminate but fleeting, entirely specific and disloyal, so that no one trusts me. I am always looking away. Or again at some thing after it has given me up. I makes me restless and that makes me unhappy, but I cannot keep them still. Turning to what steadfastly thwarts any alignment by moving away. High apolitical dudgeon. In 1949, O’Hara had a course at Harvard with Renato Poggioli, “Theory of the Advance-Garde Art”—Poggioli testing out the crux of what’d become the 1962 book, Teoria dell’arte d’avanguardia. Poggioli trying to duck out under a tangle of barb’d wire that historically align’d the avant-garde with political radicalism. A neutering. Is it there that O’Hara’s “stance”—so ably and memorably delineated by Ashbery in 1966, “Frank O’Hara’s poetry has no program and therefore cannot be joined . . . and is thus a source of annoyance for partisans of every stripe”—is found’d? Or is it “merely” temperamental—an impetuosity, a rush that cannot be slow’d by joinery? (I think now of Renato Poggioli, whose book I may’ve gander’d at in my scuffling days, and it is the happy frisson of Sylvia Poggioli’s NPR sign-off, pronouncing “Poggioli” with a hint of something chewable in the double g that serenades my poor dark brow, collapses my bright construct, turns me elsewhere, attending.) That is how it works. For the “slow poetry” regenerates—isn’t the danger in relenting (whilst the brute agon of the moment charges forth endlessly, oil or no oil) a falling into mere “generalizing” thought? See Olson’s “Human Universe” distinction between “language as the act of the instant and language as the act of thought about the instant.” Where goeth the “MOVE, INSTANTER” under such? The percept’s got to splice the air forking (making its own path) like lightning, with lightning speed. (Of course, if one’s talking about grabbing up detritus off the public roadways and jigging it about in some jerry-rig’d simulacrum—that’s not writing anyhow. That’s Lego-work.) (Of course, if one’s talking about printing books, “that glut,” sure. My “policy”—so precisely’s I am able to accountancy it—is, roughly one book per quarter century. Rubbing Torsos, 1979; Breeze, 2003. That ought to be sufficient for anybody.) (One note: that “SloPo” monicker rather deftly defeats the intent—abbreviatory mangles signal a corner’d market and empty into the dirty stream where conservation’s no longer stung by the archaic (“the impulse to recover beginnings and primal energies”), that ethical center of the modern; “besides, they are ugly.” One’d do better with something like “lackadaisical verselet-ing.”) I start’d a piece call’d “The Poppies” that went “contend against local breezes, little juggernauts / of the indistinct . . .” and stop’d. 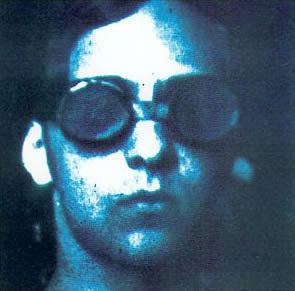 René Daumal wearing paroptique glasses.